Ukrainian prime minister's press office ridicules Alexander Bastrykin's claims. 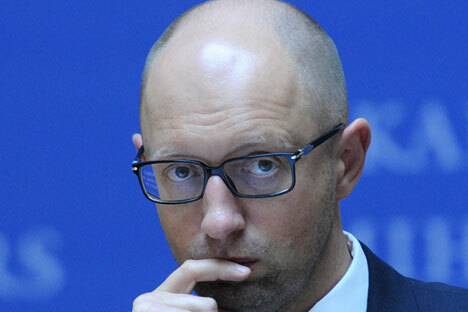 Ukrainian Prime Minister Arseniy Yatsenyuk's press office has ridiculed claims by Alexander Bastrykin, head of the Russian Investigative Committee, that the committee has information about Yatsenyuk's alleged participation in the first Chechen War, including allegations that he participated in the torture of Russian soldiers. Commenting on Bastrykin's scandalous announcement, Yatsenyuk's spokeswoman Olga Lappo said: "We suggest that the Russian regime subject Bastrykin to a psychiatric test. This is the same Bastrykin, who along with other psychopaths, cynically convicted [pilot] Nadezhda Savchenko, [director] Oleg Sentsov and other Ukrainian patriots. Goebbels and the Nazi propaganda machine can applaud Putin's team," Lappo wrote on her Facebook page. Bastrykin had made the claims in an interview with the Rossiyskaya Gazeta newspaper, in which he said that Yatsenyuk had "participated in at least two armed clashes. One occurred on December 31, 1994 on Minutka Square in Grozny and one in February 1995 in the vicinity of the Number 9 city hospital of Grozny. He also participated in the torturing and shooting of Russian army soldiers in the Oktyabrsky neighborhood of Grozny on January 7, 1995." Bastrykin added that Yatsenyuk fought in Chechnya in the Argo punitive detachment and then in the Viking detachment under the leadership of Alexander Muzychko, and was even awarded by Chechnya's first president Dzhokhar Dudayev with the Nation's Honor medal. The Kremlin responded to Bastrykin's accusations by saying that such accusations could not be unfounded. "The investigative committee is still working and such accusations are not unfounded, and until the committee finishes its work and presents a formal decision, it is perhaps too early to make any comments," said Russia's presidential press secretary Dmitry Peskov.